Lennox has established their company on the values of trust, quality, and innovation. Lennox is committed to not only creating a better home environment for their customers but also a better global environment for generations to come. Find out why Lennox is the best choice for your home. 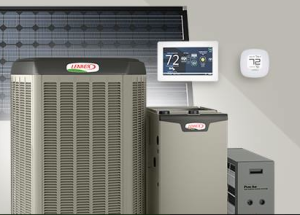 Any Lennox Dealer is an expert HVAC professional, however, Premier Dealers are the best of the best. The Bosworth Company is an honored 11-time winner of the Dave Lennox Premier Dealer Award. At Bosworth, we are trained to deliver a premium level of comfort and service. We listen, respond to your needs, and recommend the best Lennox solution. As Dave Lennox Premier Dealers, we are regularly evaluated through a review process based on customer satisfaction. To maintain the Premier Dealer status, we must achieve the high standards set by Lennox. In addition to being held to the high standard of customer service, we are able to offer some of the best available products on the market, including products from the Dave Lennox Signature Collection.